Ibanez acoustic instruments are known to bring a great combination of performance but also style. A great example of this is Ibanez AEB10E. 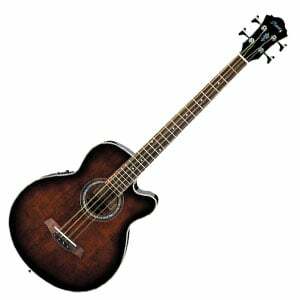 It’s among the most elegant acoustic bass guitars you can find at the moment. Not to worry, its rather flamboyant looks are backed up with impressive performance. If aesthetics were the key metric in determining the value of guitars, Ibanez AEB10E would pass with flying colors. However, that is not the case. Even so, this Ibanez has all of its bases covered. What we have here is a concert body with a cut off. Tonewood of choice includes mahogany back, sides and neck, combined with a solid spruce top. The finish Ibanez went with is a dark stain burst. Combined with pearl inlays, abalone rosette and pearl binding, you get one very good looking guitar. In terms of build quality, Ibanez stayed true to their reputation. Fit and finish are top notch especially if you consider that this guitar is made in one of their secondary factories. Everything about it inspires confidence from the moment you first pick it up. Things get even better when you start playing it. More on that a bit later. They say that hardware defines an instrument. Fortunately for us, Ibanez AEB10E features a great set of lockers and a proper rosewood bridge. 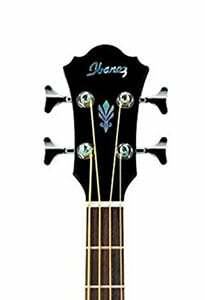 Ibanez die cast tuners may appear to be fairly basic on the outside, but the mechanisms themselves have proven to be capable of withstanding frequent and intense use. Naturally, the importance of proper tuners is even more emphasized when dealing with thick bass strings. Bridge and saddle come out set up fairly well out of the box, although there’s always room for improvement.Ibanez turned to Fishman for on­board electronics. They have chosen a combination of anSST preamp and Sonicore pickup for this build. This combo has been proven numerous times so far in different models. SST preamp features bass, treble and volume controls as well as a built in tuner. Again, a fairly basic setup but one that works. When it comes to sound, Ibanez AEB10E punches tangibly above its weight class. We can probably attribute that to a great choice of materials, proper bracing and that legendary Ibanez know­how. Despite this not being a hand made model, their mass manufacturing processes are on point if you want consistency. Tone is well defined with plenty of girth in the low range. Mids are present and clear, while trebles come across as punchy. All together, you are presented with a well balanced tone profile that carries a good amount of warmth. In terms of plugged in sound, Fishman does what Fishman does best. Even thought this is far from their best preamps or pickups, the combo on this bass guitar fits its nature pretty well. You are getting a very authentic plugged in sound with a good amount of maneuvering space thanks to the on­board EQ. Ibanez AEB10E is a truly magnificent bass guitar. The looks alone are enough to draw anyone closer. However, it is the performance that really reveals its true worth. 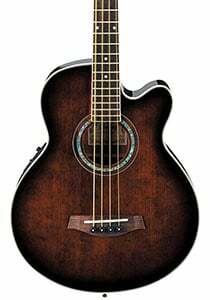 If you are looking for a proper mid range acoustic bass guitar, chances are you won’t find something much better than this. For more info about the Ibanez AEB10E, click here.